The farmers' market in July is bursting with inspiration -- there are shiny vine-ripened watermelons, plump ears of yellow sweet corn, regal, midnight black eggplants, and sassy, tart green tomatoes. So many dazzling colors and shapes and textures and fragrances make your head dizzy (though that could be the summer heat). So when I returned home this past Saturday from the farmers' market, I surveyed my finds and immediately thought: OK, it's gotta be something with sweet corn and cherry tomatoes, because they go together like milk and sugar. And what's summertime corn without some fat shrimp and sweet basil? The result: It tasted like a breezy, blue-skied, July day. How about you? What types of farmers' market-inspired meals have you been making? 1. Bring quinoa and water to a boil in a small saucepan over high heat. Reduce, partially cover, until the water is absorbed, about 15 minutes. The quinoa will be done when it turns partially white and the spiral-like germ of the grain is visible. 2. In a small bowl, whisk 2 teaspoons olive oil, lemon juice, salt, and cayenne pepper. Set aside. 3. In a large skillet over medium-high heat, add remaining 1 tablespoon olive oil. Add onions and saute 2-3 minutes, just until wilted. Add shrimp and saute until they turn bright red and are lightly browned on the edges. Add the corn and tomatoes, and heat through for 2-3 minutes, just until the tomatoes begin to wrinkle. 4. Add cooked quinoa directly into the skillet and toss with the shrimp mixture. Add the basil and the olive oil and lemon juice mixture. Toss gently. Serve hot or at room temperature. P.S. Congratulations to Diana H of Cookerati! You won the copy of the I Love Trader Joe's College Cookbook! Thank you to everyone who participated. There will be many more give-aways to come. This sounds great! I can't wait to give it a try. I try very hard not to buy anything but fruit at my farmers' market. I have plenty of veg in my backyard. No corn unfortunately. My cucumbers, tomatoes, green beans and basil can combine in so many ways for salads and pasta. Throw in a bit of feta or mozzarella and it's a meal. Ok so this looks amazing. I'm going to have to make it sometime! Literally JUST made this for dinner minus the shrimp, with red quinoa. Holy Moly. It is DELICIOUS! This dish is the perfect use for shrimp and quinoa! Looks delish! mary-You're lucky. I don't have a yard, but I'm fortunate to have beautiful farmers' markets. I agree. I cukes, tomatoes and green beans are three of my all-time favorites. Lately, I've been roasting the string beans, then tossing in chopped tomatoes, and drizzling with lemon and olive oil. I've got to try your lime vinaigrette with the tomatoes and cukes. I might toss some jicama in there too. Thanks for the thoughtful comment! tinydancer-Yay! I'm so happy you liked it. I too love red quinoa, but I haven't been able to find it lately. I may have to get it online. Long-time reader, first time commenter. THANK YOU for this recipe. I was looking for inspiration for tonight's dinner and of course you came through. Just happen to have all these ingredients on hand. Oh, and we moved from San Diego about a year ago and miss it terribly. Thanks for the little nuggets you provide that remind me of home. Thanks for the link!! Wow, your quinoa looks fantastic!! And soo summery too! nat-Thank you so much for commenting! It's a warm crowd here, so I hope you'll be back. I would miss SD terribly too, so I'm happy to share some nuggets with you anytime. I know that when readers from RI do that for me, it just makes my day. I wanted to let you know that I featured this on my "What I Bookmarked This Week" post - stop by and see! danielle-I really appreciate it. Thank you so much! I tried to leave a comment, but I couldn't find a comment box. So I was one of your winners of your cookbook before fathers day and have not gotten my book. I sent you an email with my mailing address...is there a problem, please let me know. I love this dish! Yesterday I poured vodka into several mason jars, threw in loads of fresh berries from the market and left them to infuse. It's not so much a "recipe" as a sweet indulgence. My farmers' market soup would involve me taking all your money and selling you a lot of stuff you don't really need. Only joking, this soup looks great! figs&artichokes-I never received an email from you. I just emailed you. Please send me your name and address, and I'll send you a book. Thanks for letting me know. carrie-Sweet damn, that sounds good! This looks absolutely delicious and so colorful too. I haven't tried quinoa yet but it's been on my mind and your recipe and picture has inspired me to make this. Honestly Susan, I am making this for dinner next week if I can wait that long! just perfect! This looks amazing! It's raining over here (really horrible weather) but I would love to have a bowl of this! Gonna try this with crawfish and see how it comes out. Sounds awesome! I can only imagine the fresh textures and flavors in this dish. Thanks for sharing! 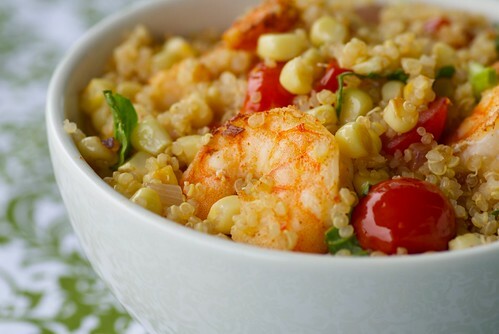 Right now I am loving the corn and tomatoes and I love your recipe with the shrimp. What a great additions. I am always looking for good salads for quinoa and this one looks delish! Thank you! I'm looking forward to trying this! I just made a salad last week with fresh corn kernels, black beans, colored bell peppers, cucumbers, onion and dill. this sounds so delicious .. thanks for sharing .. i love it .. I made this recipe and it was delicious.